The speakers on most projectors are relatively weak and don’t have the best sound quality, especially when it comes to the lower end of the sonic spectrum. A soundbar is a compact means of adding an external sound source. We’ve spent some time looking for the best soundbar for projector-based home theaters, a search that yielded the five results below. There’s something on this list for every budget and scenario, so read on below to find the perfect soundbar for your needs! Sonos is one of the leading names in sonic technology, and with their Beam soundbar, you’ll get one of the most advanced options currently available. (>>>Check it’s pricing here) Not only is the sound quality top notch it’s also enabled for Alexa voice control automatically, making it the perfect option for anyone with a smart home system. As you might guess from the inclusion of Alexa, the Sonos Beam is a wireless speaker. Since most projectors don’t come with built-in wifi, this does mean you’ll need to purchase a wireless dongle for your projector before you can use it. On the flip side, a wireless speaker is a super convenient option once you have it set up, especially if you use a ceiling mount for your projector. Convenience is definitely the strongest selling point of the Sonos Beam. It’s ultra-compact, fitting easily on a bookshelf of coffee table, and it can be wall-mounted as well. You’ll also easily be able to integrate other speakers from the Sonos line if you want to set up a surround sound or multi-room music system. It’s also very easy to set up and control—just download the Sonos app and plug in the Beam, and you’re pretty much ready to go. The Sonos Beam also delivers when it comes to sound quality. In our opinion, it’s the best-sounding soundbar on the list. It uses powerful woofers for the low end, and also gives users options like speech enhancement to improve dialogue clarity. If you’re looking for the most advanced soundbar you can get your hands on, this is a definite contender. Consistency is the name of the game when it comes to Yamaha electronics. This is especially appealing in their mid-range products, which are built to the same exacting standards as their top of the line models, making them an overall exceptional value. The sound is fantastic through this soundbar, too. There are a total of four drivers (two woofers and two tweeters) and it uses Yamaha’s proprietary DTS Virtual X sound, for a more resonant and authentic playback. It’s especially good with dialogue—very crisp and clear at every volume level. It supports 4K content, too, and the gyroscopic internal technology makes sure the sound is always directed at you, no matter how or where the soundbar is positioned. Our only complaint about the YAS-108 is that the controls aren’t as intuitive as other models we looked at. Changing the settings and enabling features takes some practice since there’s no LED display on the soundbar. If you’re willing to take a bit of effort to learn the system, though, this powerful soundbar is an exceptional value. The inclusion of a universal remote makes the Bose Solo 5 easier to use than many other soundbars. The remote can control everything from the volume to the Bluetooth settings, all very intuitively and without needing to leave your couch. It’s also very easy to set up and is flexible in terms of how you position it. In terms of sound quality, dialogue mode is probably the most impressive feature. It adds clarity to spoken lines without sacrificing sound quality of effects or music behind it, saving you the hassle of adjusting the volume every other scene. The bass response is full and powerful, and you can adjust it independent of the overall volume on the included remote. The Bose Solo 5 won’t put out as much volume as a full surround sound speaker system. It’s loud enough to serve as the only speaker in a smaller room—and definitely gives you more volume than your projector’s speakers—but you may need to supplement it with more speakers in a larger space. If you’re more considered with sound quality than maximum volume, though, this soundbar will serve you well. One nice thing about this Vizio system is that it comes with everything you need to set it up. This includes a variety of audio cables as well as mounting brackets—something you have to buy separately with many soundbars. The only extra you might need to buy is a Bluetooth dongle for your projector if you want to connect it wirelessly. The external subwoofer does make this system less compact than all-in-one designs. This might be a problem for those in dorm rooms, small apartments, or other cramped spaces. The advantage of the subwoofer, of course, is the deep, full bass. When you crank this unit up, the sound will truly fill any room, and the sound stays clear even when it gets loud. 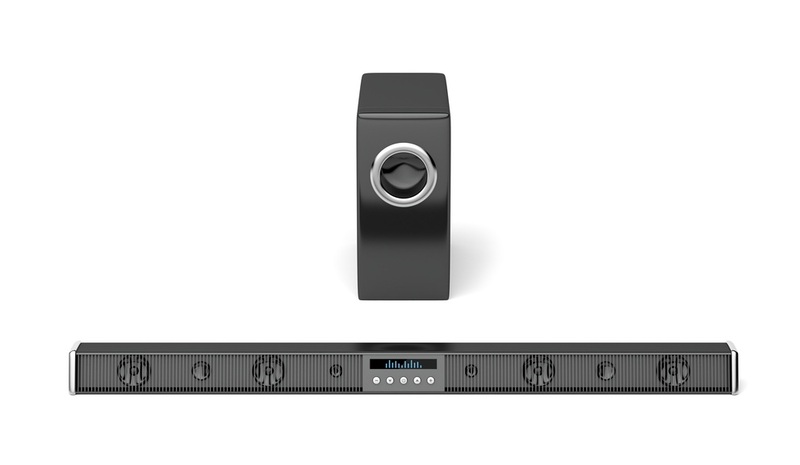 The biggest improvement Vizio made to the 2018 model of this soundbar system is the inclusion of DTS Virtual X technology. This makes the audio truly immersive, simulating the effect of a full surround sound system with only two pieces of equipment. It’s probably the best sound you can get for less than $200, and it’s an especially great value considering all the extras you get in the box. Vizio also has you covered if you’re looking for a soundbar on a tight budget. The SB2920 Sound Bar provides up to 95 decibels from two built-in, full-range speakers, at a price that’s under $100—definitely, the most affordable soundbar featured here. Despite the low price, the Vizio SP2920 doesn’t sound cheap. It has the same low rate of harmonic distortion as the more expensive models in Vizio’s catalog It can get pretty loud, too, up to 95 decibels of well-balanced sound. It uses Vizio’s DTS TruVolume technology to even out the sound between scenes, saving you from needing to constantly adjust the volume up and down. You don’t have to sacrifice performance for an affordable soundbar, either. It still offers Bluetooth for a wireless set-up, and it’s super simple to get it up and running. It comes with a remote for easy control of the volume and settings, and though it’s simpler than the remotes include with other models, it has all the functions most users will need. The compact size of this soundbar makes it perfect for small spaces. The sound quality is great for the price. The bass isn’t especially powerful and it won’t get as loud as some of the other options above, but it will deliver sufficient sound for most users—and a huge improvement over what you’d get from your projector alone. The biggest question you need to answer when you’re shopping for a soundbar is what kind of audio you want to use it for. If you’ll mostly be watching TV shows and movies, the clarity of the spoken word is arguably more important than the bass response or maximum volume. Many soundbars offer speech-specific settings that are great for this kind of content. The great thing about soundbars is that they offer quality sound in a compact package—often at a better value than other speaker styles. Consider your space and your budget along with the sound quality and you’ll be guaranteed to find something that satisfies all of your sonic needs. Next articleHow Many Lumens is Good for a Projector?